15 Years of this amazing game of discovery, exploration and adventure is a really big deal. 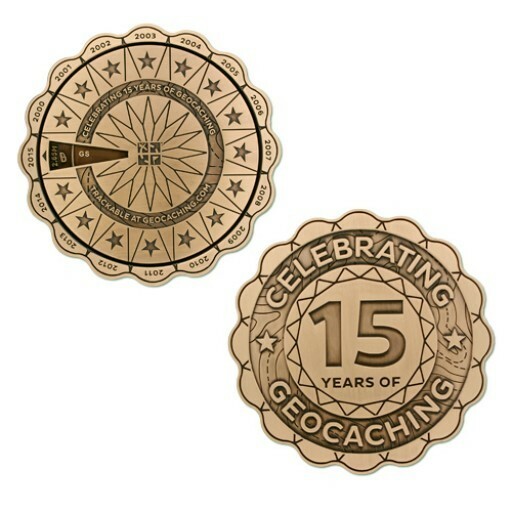 To celebrate, we knew that we needed a really big geocoin! This coin goes beyond just its impressive size and weight. This coin is here to impress and to educate! This amazing design by our very own Nathan has a unique spinner on the back with some interesting facts and firsts about each of the 15 years that people have been getting out to play. You also get to see just how many geocaches there were to find each of those years. Just line up the window to any of the 15 years, and get ready to be informed and enlightened! Celebrate 15 Years the Ultimate way, but just remember this very unique and amazing coin is only available for a limited time. Measures approximately 2.75 inches across, is nearly .25 inches thick and weighs in at an impressive 1/4 pound!